On their debut 12” EP for Ever/Never Records, New York City’s BALLROOM explode out of the gate with a whirlwind fury. 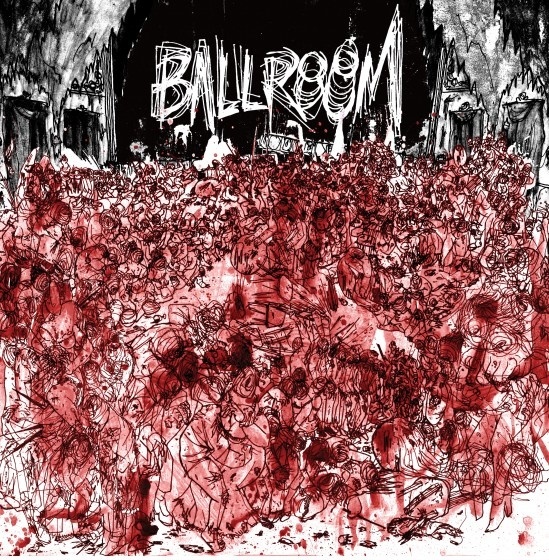 Anchored by a tornado of vicious snare drum thwacks and excoriating guitars, BALLROOM are a powerful ensemble assembled from scattered remnants of other notable bands. Cecil (who also plays guitar) did time in Chicago punk standout Busy Signals, and has featured in numerous NYC bands since his relocation. The other axe-slinger, Kristian Brenchley, is a founding member of long-running scum rockers Woman, and also lays down the bottom end in Ever/Never labelmates Degreaser. BALLROOM low-end is provided by Home Blitz’ Theresa Smith, while the drums are beaten into submission by Steven Fisher, leader of Wilful Boys and Dozers. Their debut 12″ EP points to a key influence — the sun-scorched blacktop rumble of prime Scientists, Australia’s sultans of swamp. BALLROOM‘s debut features no mellow songs, sappy ballads or moments of false sincerity. Some songs could be feedtime cuts, but there’s also echoes of the Gun Club and past Crypt Records powerhouses like The Beguiled. BALLROOM doesn’t so much ride off into the sunset as reach up into the sky and pull it down into the dirt. NORTH AMERICAN GHOSTS are Bradley Coomes (bass, effects) and Zachary Goldstein (drums) riffing on messed up grooves and grooving on messed up riffs. This entry was posted in Activities, Beer, Bourbon, Upcoming Events, Wine and tagged Ballroom, Ever/Never, Kaiju, North American Ghosts, Upcoming Events on August 14, 2015 by othersideoflife.